Buying a piece of fine art painting is a big deal. A lot of times, collectors acquire paintings not just for their aesthetic aspect, but as an investment and a store of wealth as well. With that in mind, taking good care of your lacquer paintings becomes doubly crucial. Taking care of art work is a topic well covered. But there seems to be a dearth of information relating specifically to lacquer paintings. Hopefully, the guidelines shown here would go some ways towards addressing that …..
Over the long term, adverse humidity and temperature can do some serious damages to art work. The first rule of thumb is to avoid drastic and sudden changes in humidity and temperature. For lacquer paintings, a higher humidity is actually beneficial to the paintings. Humidity in the tropics is just fine for lacquer painting. Needless to say, they should not be exposed to direct sunlight or be put closed to any heat source, such as a fireplace or a heater vent. Moving them require extreme care because they are heavy. The most vulnerable areas of a lacquer painting are the edges and the corners. Any knock to these areas might well cause the layers of paint to crack and peel off. This is not to say that knocks to other areas are fine! 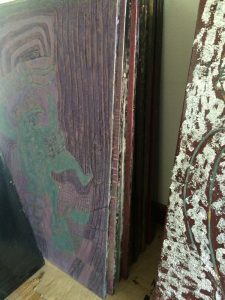 Vibration is generally considered bad for lacquer paintings! It is advisable to keep them in a vertical position, preferably front to back. Do not stack one on top of another in a horizontal position. Due to their weight, the pressure on the lower pieces would be very high and likely to cause damages. The picture below shows the right way. Once in awhile, it is also good to wipe them down with a piece of soft cloth. Dampen it with a bit of water. Unlike oil or acrylic paintings, a bit of moisture would not damage the lacquer paintings.